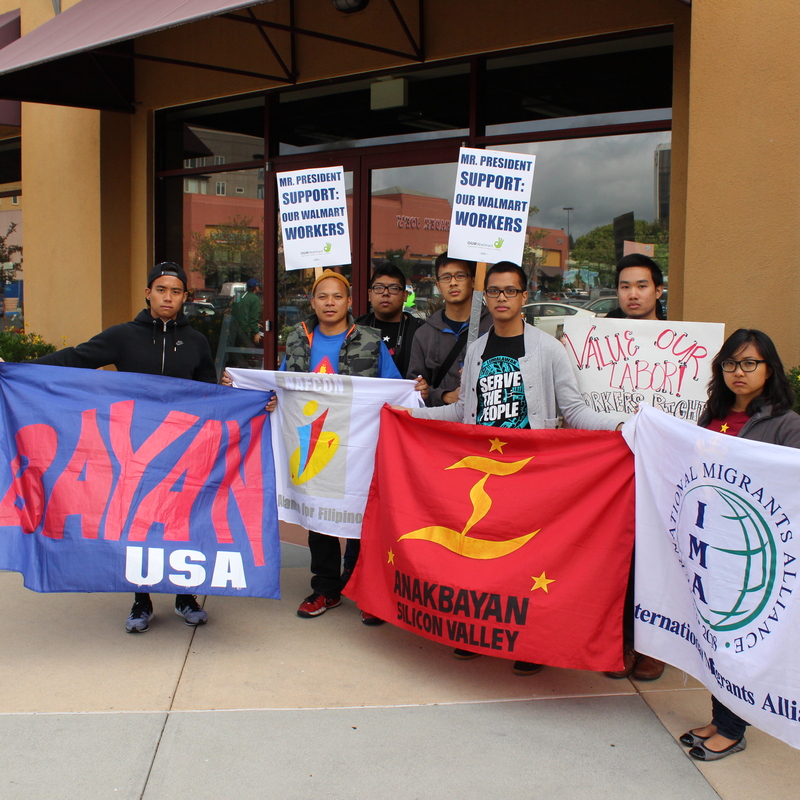 Thursday 5/8 Mountain View | Friday 5/9 San Jose — Members of Anakbayan Silicon Valley (ABSV) greeted President Obama this past Thursday, May 8th, and Friday, May 9th with calls to uphold workers’ rights, stand for environmental justice, and protect Philippine sovereignty. On both occasions, ABSV condemned U.S. militarization in the Philippines through the Visiting Forces Agreement (VFA) and recently signed Enhanced Defense Cooperation Agreement (EDCA), as well as unregulated environmental destruction and human rights violations in the country caused by multinational corporations, many of which are based in the U.S. These actions have contributed to the conditions in the Philippines under which the people are forced to migrate–many to the U.S.–only to find themselves as exploited workers. 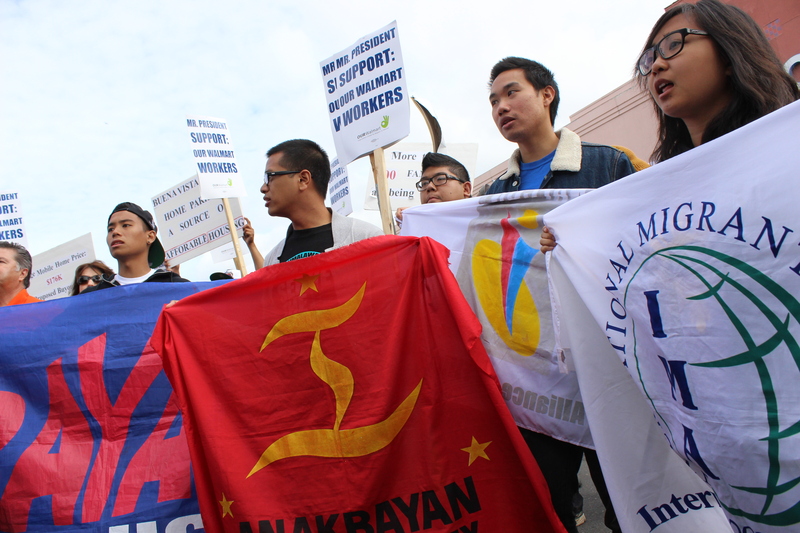 ABSV marched with members from the Pilipino Association of Workers and Immigrants (PAWIS), National Alliance of Filipino Concerns (NAFCON), BAYAN-USA, and International Migrants Alliance (IMA) South Bay on both dates. 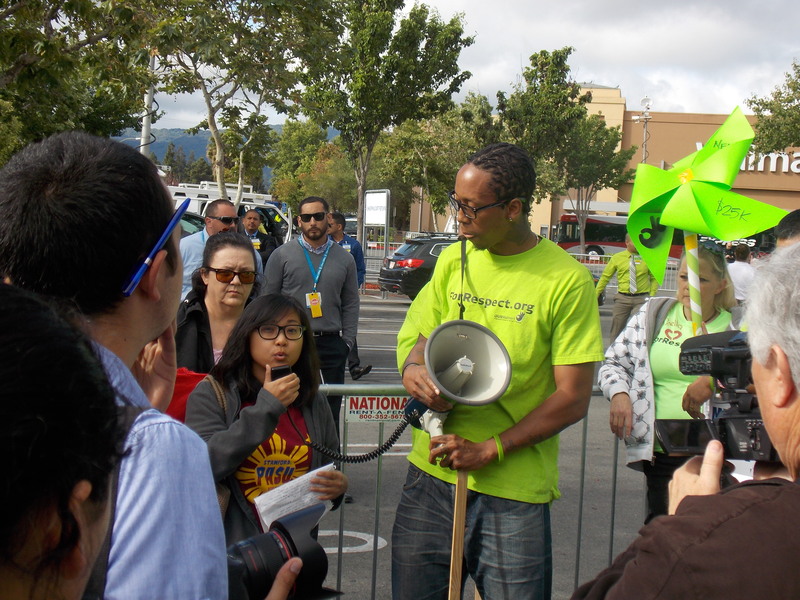 On Thursday, the contingent marched in solidarity with many other protesters calling for environmental justice in San Jose’s Cesar Chavez Plaza, outside of the Fairmont Hotel where President Obama held a fundraiser. ABSV member Julian Jaravata discussed the Trans-Pacific Partnership Agreement (TPPA), a massive trade agreement spanning the Asia-Pacific region. He highlighted the consequences of the TPPA on the environment and workers rights, explaining that “it would literally allow corporations to sue governments if they attempted to restrict business practices that are destructive to the environment or harmful for workers.” ABSV is strongly opposed to the TPPA, and holds that it would be disastrous not only for the Philippines, which has shown interest in joining the multilateral agreement, but for all countries’ national sovereignty. Nasol criticized the recently signed Enhanced Defense Cooperation Agreement, which extends the ability of the U.S. military to be stationed in the Philippines indefinitely, effectively transforming the country into a base for U.S. forces despite the banning of bases from the Philippines in 1991. “We cannot stand for more militarization that forces our people out of the Philippines and into working conditions that are exploitative, as they are here at Walmart,” she continued. ABSV called on Obama to pull out U.S. forces from the Philippines to further prevent the conditions that lead to forced migration, as well as to champion workers’ rights here in the U.S. Currently, on average over 4,700 Filipinos leave their country every day to find work abroad, many of whom go to the U.S. Workers at the Walmart location indicated that around 80 percent of the workforce there comprised of Filipino workers. ABSV stands in solidarity with all those fighting for environmental justice and workers’ rights, and links arms with those demanding that the Obama administration be held accountable to its actions. WORKERS’ RIGHTS ARE HUMAN RIGHTS! JUNK THE TPPA AND EDCA! U.S. OUT OF THE PHILIPPINES! STRUGGLE FOR FREEDOM AND GENUINE DEMOCRACY!